New Yorkers Enza Friedman (left) and Madeline Baucom run Matty’s Fatty’s Bakery in Cornelius. You don’t have to be a New Yorker to enjoy Maddy’s Fatty’s Bakery on Catawba Avenue off I-77 Exit 28 near Lake Norman. But if you’re from The City you’ll likely feel especially at home. You’ll see black-and-white cookies with distinctive chocolate and vanilla icing, an NYC favorite. There are also crumb cakes and cheesecakes. And the small jam-filled rolled pastries called ruggelah. On Fridays watch for challah, the traditional Jewish braided bread. 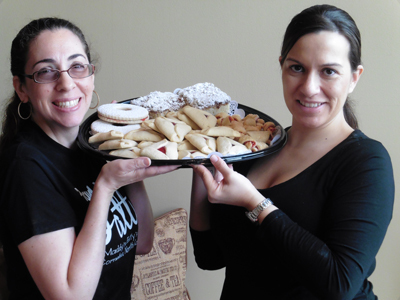 This week look for hamantashen baked especially for the Jewish holiday of Purim, which comes up Wednesday and Thursday March 23-24. The triangular jam-filled cookies recall Hamen, an ancient villain who was foiled in his plans to murder Jews. Bakery co-owner Madeline “Maddy” Friedman Baucom grew up Jewish in Rockland County just outside NYC. When her parents moved the family to northern Mecklenburg County in the early ‘90s, she felt alone in a place that then had few people from the urban North. “We had to go down to Charlotte to find a Jewish temple,” she recalls. Today, though, Temple Kol Tikvah in Davidson draws a sizable congregation from the Lake Norman suburbs. “The Lake Jews, we call ourselves,” she says with a chuckle. With sister-in-law Enza Germano Friedman, Baucom opened the bake shop about four years ago. “We’re a custom bakery,” Baucom explains: “We’ll make anything for anyone.” The unusual name, “Maddy’s Fatty’s,” refers to taunts that now-svelte Baucom endured when she was a chubby kid. “Revenge never tasted so sweet,” proclaims the bakery’s motto. Friday – Saturday 7 a.m. – 8 p.m.